Happy Monday y’all! After a nice weekend relaxing and catching up with friends, I’m back to work interviewing potential candidates for my new employee! I also have a bunch of fun holiday parties this week, so it’s going to be jam-packed. Don’t forget about the holiday shopping event I’m hosting at Tory Burch in Dallas this Wednesday! Come by the Highland Park Village boutique between 6-8pm on the 9th to hang out with my and shop my favorite present picks and holiday outfits! Get all the details here. With all that’s going on, I’ve been wearing carefree, comfortable outfits that require no muss, no fuss. Basics like this cashmere camel turtleneck (on sale!!) and my favorite black skinny jeans have been getting a ton of wear lately! The sweater also happens to match my new Preston & Olivia hat! What I love about Preston & Olivia is the sizing. 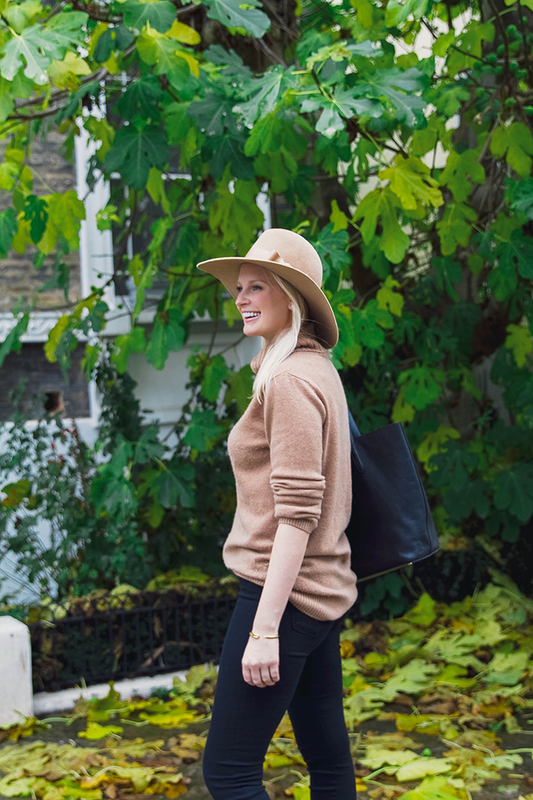 So often I find hats I love, but are one size fits all – which let’s face it, they never freaking fit. You can get any hat you love in a variety of colors and in the size that fits you best! There are so many options to choose from! Preston & Olivia hats make a great holiday gift, because it’s one luxe accessory people don’t often think to buy. A few other styles I’m loving right now are the Malby, the Marie and the Isabelle. So chic! 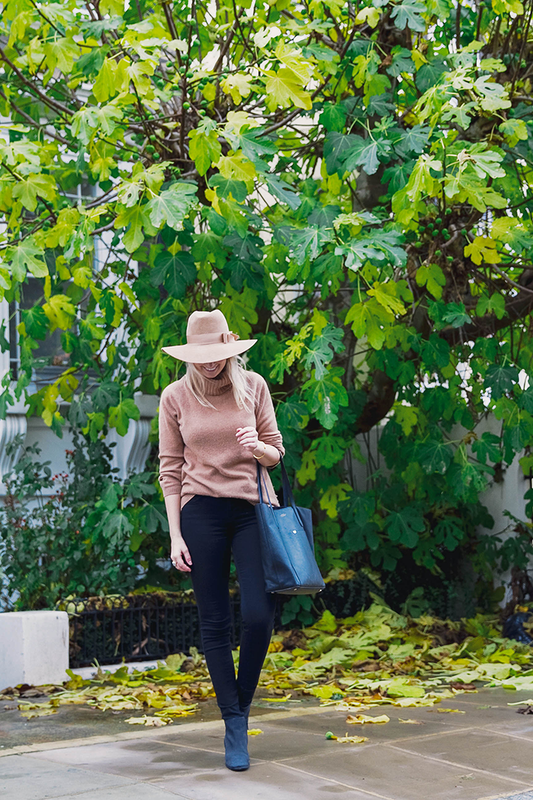 I love everything about this casual look – especially that turtleneck which looks super cozy! I could live in sweaters like this one! Great outfit. Cannot go wrong with the turtleneck and skinny jeans combo! Looking fabulous Merritt! Beautiful neutral outfit! Love the hat! This look is so gorgeous!! I love how basics put together look so amazing. And those boots are on point! I love your camel turtleneck! I love how you make such an everyday style look so chic and effortless. love your new hat! cute fall look! 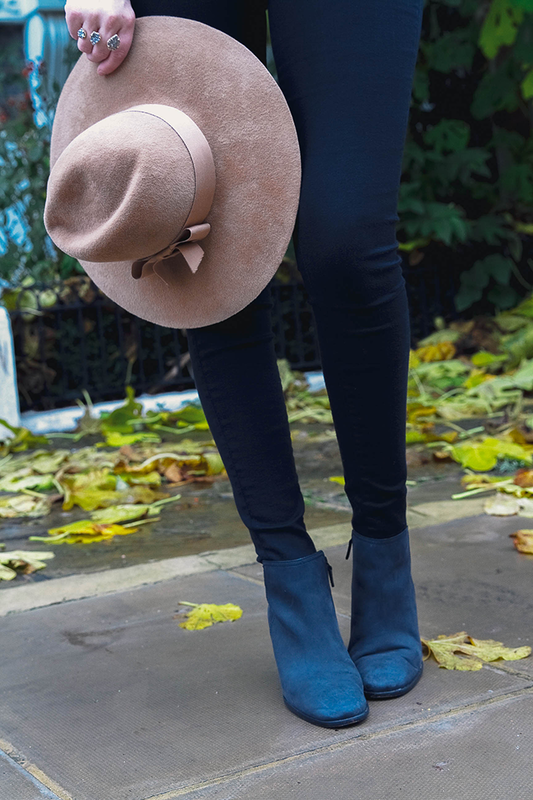 Love this color combo and your new hat! Looking good, lady!! I hope your search is going well. And good luck at your event! I love this outfit. You were so right about loving basics like this. I love how you paired the boots with the pants. I definitely need to invest in dark booties to go with dark leggings/pants! Love the effortless look here! Love this classic look and the hat looks amazing on you! I simply adore your outfit <3 These are totally your colours.